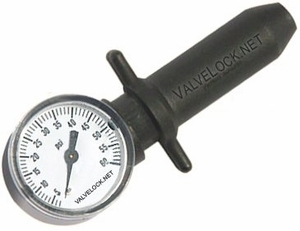 The ValveLock Tire Pressure Gauge is a device that temporarily seals to the valve stem of your tire while you check the pressure. This ingenious device eliminates the trial and error hassle of checking tire pressure by creating a leak-free seal with the valve stem. Unlike conventional pressure gauges, it works by a gripping mechanism that pulls the gauge onto the valve stem for zero air leakage during measurement. It also has a unique purge button that allows you to release excessive pressure until pressure reaches your desired reading in real time without removing the gauge. The gauge has an accuracy of �0.9psi. 15psi for ATV's and Lawn Equipment is super accurate and is a couple of dollars more. Place ValveLock over the valve stem. Allow it to seat on the valve stem. Hold your palm steady and squeeze your index and forefinger together. Read the pressure displayed on the dial. If there is too much pressure in the tire, use the purge button to release excess pressure until it reads what you desire. Remove ValveLock & replace valve cap. 3 psi Models; 15psi for ATV's and Lawn Equipment, 100psi for truck tires, 60psi for passenger cars SUV's and low profile tires.